The MOT Test is a yearly comprehensive check of a motor vehicle carried out by trained personnel who have been checked and vetted by VOSA who are the governing body that looks after all aspects of MOT Testing and vehicle checks throughout the country. 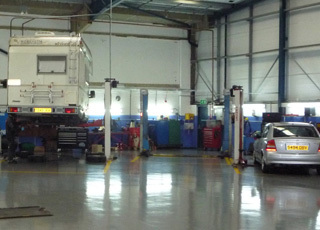 Here at our new premises much like our old premises we can carry out MOT tests to the very largest of vehicles that other testing stations cannot accommodate due to either their height or length or even both and that is why we have continued to use a MOT pit instead of a ramp as this gives us a greater and wider aspect of vehicles that we are able to test. Whether you have a car or a light commercial vehicle or even the largest motor-home or limousine, Standish Service Station Ltd can accommodate it. Why not contact us and one of our friendly trained staff will book your vehicle in for its annual test at your convenience. Please leave us your feedback by rating us. View our latest news and like us on Facebook. For all our latest tweets, follow us on Twitter. Standish Service Station is part of the Good Garage Scheme. Click here to rate us online.